내시경을 배우고 있는 여러 전공의, 임상강사 선생님들께 아래와 같은 질문을 했습니다. 정답이라고 할 수는 없지만 마지막에 저의 의견을 붙였습니다. 이 증례에 대하여 추가 의견이 있으시면 언제든지 제게 메일을 주시기 바랍니다. 사진을 보시고 내시경 소견과 impression을 내시경 결과지에 쓴다고 가정하고 각자 써 보십시오. 그리고 그 내용을 저에게 메일로 보내주시기 바랍니다. 소견: On the PW of LB, 1.5 cm sized spiculated ulcerative lesion was found. On the central lesion of ulcer, nodular hyperemic mucosal lesion was found with peripheral focal nodular mucosa. Peripheral fold was cutting ,tappering and fusion. 소견: 중부 체부 후벽에 약 1.5cm 정도 크기의 병변이 확인된다. 병변의 주변은 융기되어 있고 중앙부는 저하되어 있어 얕은 궤양 정도로 보이며 불균일한 백태에 덮여 있다. 변연은 불분명하며 불규칙하고 일부 재생상피로 보이는 부분은 불균일하게 한쪽 변연에서만 보이고 있다. 점막주름은 원주에 균일하지 않게 분포하고 있다. 소견을 종합하여 볼때 malignant lesion 이 의심됩니다. 소견: Low body PW side 에 주변부의 융기된 erythematous 한 mucosal change 와 whitish exudate 로 덮인 ulcer 가 관찰되며 주위 abnormal converging fold 를 동반함. 소견 : On the PosteroLC side of LB, about 8mm-sized shallow depression with spiculated margin, whitish exudate, converging fold with clubbing sign, peripheral hyperemic mucosal change was noticed. Whitish mucosal discoloration was noticed in proximal site of erosive lesion. 소견: On the PW of LB, about 2cm sized irregular marigin, hyperemic nodular elevated lesion with central ulcer was noticed. Ulcer base was covered with whitish exudate and Ulcer margin was irregular. Mucosal fold distruption and abnormal convergence was noticed. 소견 : On the PW side of the LB, about 2cm sized mixed lesion with mainly about 1.2cm sized tongue-like flat hyperemic villous mucosal change was noticed. It had also about 0.4cm sized whitish coated flat depressed lesion and 0.2cm sized nodular elevated lesion. Its base was generally uneven and margin was irregular. It had abrupt cutting and fusion folds. 소견: On the PW side of the Lower body, about 2.5 cm sized depressed lesion was noticed. The base of the lesion was covered with whitish exudate, the edge was composed of irregular nodule and regenerating epithelium. Converging folds were seen from the whole directions, with cutting and fusion nature. 소견: On the PW of LB, 1cm sized depressed lesion with irregular margin, uneven edge, abnormal converging fold(abrupt cutting, fusion), irregular regenerating epithelium was seen. 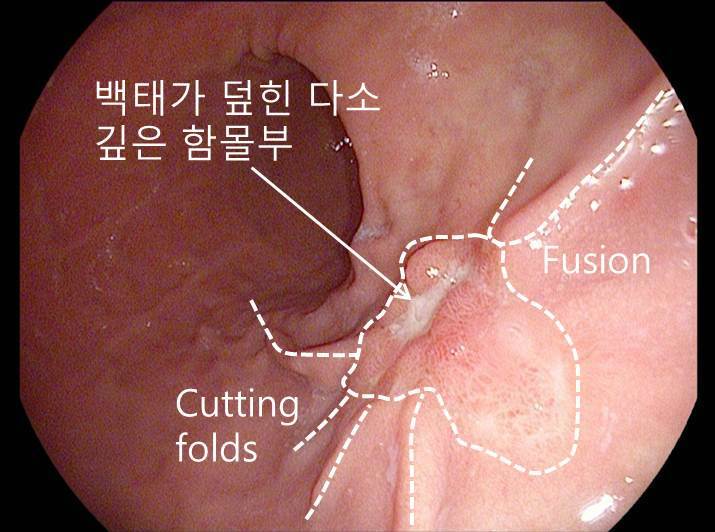 소견: On the PW side of LB, about 2.5cm sized flat elevated lesion with central ulcer showing uneven base, speculated edge, edematous margin and abnormal fold convergence such as fusion, clubbing and cutting was seen. 소견: On the PW side of the LB, about 2.5cm sized superficial depressed lesion with whitish exudates and regenerating epithelium on base, spiculated edge, irregular nodular margin with abnormal converging folds (abrupt cutting, clubbing, rapid tapering) was noticed. 위체중부 후벽에 2 x 1.5 cm 크기의 경계(edege)가 불규칙한 함몰형 병소가 있다. 전체적으로 길쭉한 병소의 근위부는 탈색과 발적이 섞인 미세한 함몰이고, 원위부는 백태가 부착된 다소 깊은 함몰인데 그 사이인 병소의 중앙부는 tumor island 양상으로 발적된 융기부가 있다. 병소의 원위부 경계에도 3 mm 크기의 발적된 결절이 있다. 원주의 일부에서 다수의 비대칭적 비정상 주름이 관찰된다. 근위부 소만에서 끌려오는 주름은 fusion되어 있고, 나머지 대부분은 abrupt cutting을 보인다. 1. 일견 백태가 덮인 좌우로 길쭉한 함몰부가 눈에 띄이지만 그보다 근위부의 발적 융기부와 더 근위부의 탈색과 발적이 섞인 희미한 함몰부를 놓치지 말아야 할 것 같습니다. 2. 주름 변화를 관찰하기에는 공기가 너무 많이 들어간 사진입니다. 공기를 조금 뺀 상태에서 관찰하였더라면 더 좋았겠습니다. 전벽과 후벽에서는 주름이 끌려오지만 원위부와 근위부로부터 끌려오는 주름이 없다는 점("asymmetry of converging folds")에 주의하십시오. 일부 fusion은 의심되는데 clubbing된 주름은 없습니다. 3. 주변 점막의 위축성 변화는 뚜렷하지 않습니다. 4. 조기위암의 내시경 분류는 가급적 EGC IIc, EGC IIa와 같이 단순한 형태를 사용하는 것이 좋지만 이 경우는 함몰부위 융기부가 뚜렷하게 섞여 있으므로 어쩔 수 없이 EGC IIc + IIa를 선택했습니다. 5. 소견은 영어 단어와 우리말을 섞어서 사용하고, 진단은 영어를 사용할 것을 권합니다. 물론 전부 영어로 기술해도 좋습니다. 그러나 영어 실력이 부족하다고 생각되면 영어 단어와 우리말을 섞어 사용하시기 바랍니다. 저는 영어 실력이 부족하여 이두문자 비슷하게 섞어 쓰고 있습니다.